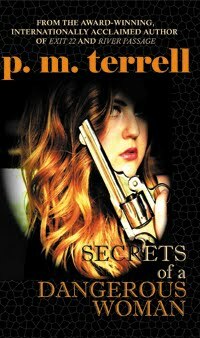 Goddess Fish Promotions is organizing a Virtual Book Tour for Secrets of a Dangerous Woman by p.m. terrell, aa 352-page suspense/thriller. The tour will run October 1 - 26, 2012, and the author is available for guest post and interviews. A PDF copy of the book is available for review in conjunction with a guest post or interview. Winners are "Ingeborg" and Chrysrawr. I'll take any date except Oct 11-15. I Can host this on my personal blog on October 2. Sign me up for any date ladies! I can host an interview or guest blog on October 4th or 5th. I can host any date at Immortality and Beyond. I would love to do an interview on the 25th!